Earn up to 1,472 reward points. Boost your tone and your style with this awesome combo. So what does that mean, exactly? It means that you’ll hear full frequency response from your Tone Job everywhere you plug it in – guitar, bass, drum machine, synthesizers, steel drums, harpsichord, kazoo or wherever! 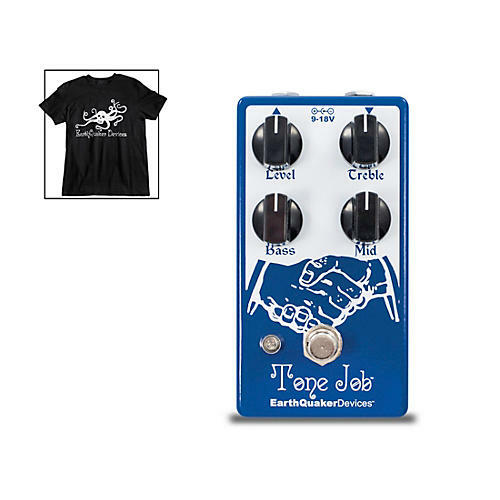 The EarthQuaker Devices Tone Job has active EQ controls for "Bass," "Mid," and "Treble," with up to 20 dB of cut or boost, which is handy for pairing up with other pedals in your chain to breathe new life into old dirt. Unlike boring old graphic EQs, the Tone Job’s EQ controls are interactive, so you can experiment with different settings to alter the response and overall feel of the Device, getting your tone out of the lunchroom and back on the clock. Place the Tone Job at the beginning of your chain to alter the overall character of your guitar, or use it at the end to boost output at the end of a long cable run and fine-tune your tone. The "Level" control on the Tone Job can boost your signal up to 5x the original input level, so you’ll always be heard, and makes for a fantastic solo and/or clean boost!